In Part Two of this series we discussed how the Servicemembers Civil Relief Act (SCRA) can stay court and administrative proceedings brought by creditors and prevent the legal proceedings from going forward while an enlisted person is on active duty. In this this third and final part, we will discuss how the SCRA can helpsomeone on active dutyby allowing them tolower theirinterest rates on many debts. The SCRA requires that interest on pre service loans must be capped at 6%. He mustinclude a copy of his orders. Even when the necessary written request is made and the orders are included, a creditor may still challenge the rate reduction. A creditor seeking to not have it’s interest rate cappedmust show that the service will not have a material impact on the service member’s ability to pay. Once a creditor receives notice, it must reduce the interest rate from the date back to the date that the service memberwas placed on active duty. With interest rates on credit cards and other loans sometimes in excess of 29%, the ability to reduce the rate to 6% can be a tremendous financial and emotional relief. There are many other aspects of the SCRA that can aid an enlisted person (one of these is the ability to void a contract of lease). Just like many enlisted persons take the time to make out a will and a power of attorney, they need to look at the protections provided by the Servicemembers Civil Relief Act. All branches of the military have attorneys as part of their Judge Advocate General (often referred to as JAG or JAG Corps) offices, and these attorneys are well versed in the ins and outs of the SCRA. 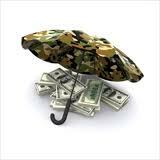 Also, many private consumer law attorneys will provide legal advice at reduced rates to active duty military.